We publish two regular e-newsletters – The Wrap and Update! – as well as member-alerts and general-alerts. 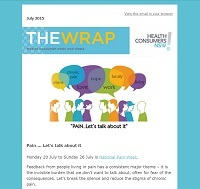 The Wrap – health consumer news and views: is a monthly or bi-monthly e-newsletter choc-a-bloc full of personal consumer stories, health and health consumer news, opportunities to ‘have your say’, resources, events and research. Subscribe to The Wrap to make sure you receive your monthly fix of health consumer news and views straight into your inbox. Update! 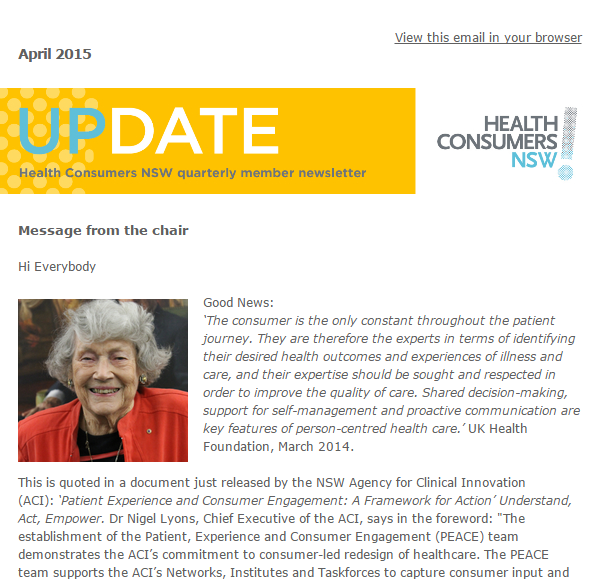 – HCNSW quarterly member e-newsletter: is our e-newsletter for all members. If you are a member, you receive it automatically. It keeps you up-to-date about what has been happening within our organisation and the work we have been doing, including any committees attended or submissions made. We also publish any vacancies open for consumer representatiation, upcoming training courses and events and opportunities to have ‘your say’. 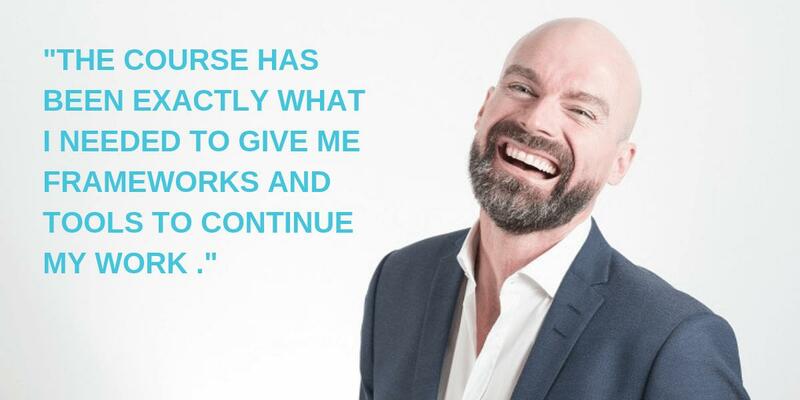 Make sure you also read the ever-popular interview series ‘A word with…’ where we talk to someone involved with the health consumer movement in every issue. 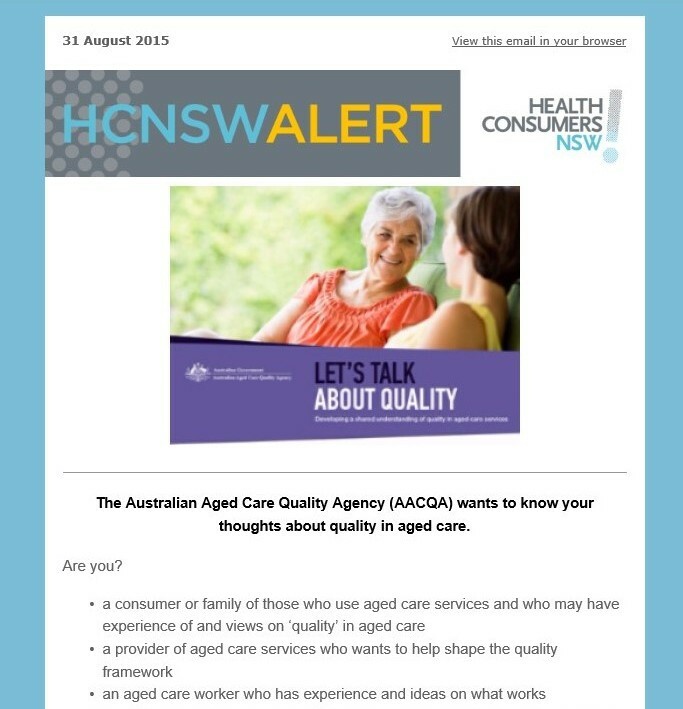 HCNSW Alerts: We send our e-alerts to both members and The Wrap-subscribers, depending on the topic of each alert. They usually conain time-sensitive opportunities to ‘have your say’, health consumer representative vacancies and updates about our training programs, forums, workshops and events. If you want to make sure you receive our general alerts, subscribe to The Wrap.